Think of the self-service things you use in a day. Gas pumps. ATMs. Online apps for shopping. They’re convenient and easy to use. People choose what they want, when they want – without involving others in their minute-to-minute decisions. 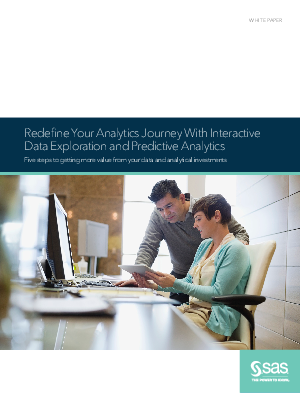 What if your organization could treat data discovery and analytics the same way? SAS has combined two of its visual solutions to do just that. SAS Visual Analytics and SAS Visual Statistics share the same web-based interface to provide self-service data exploration and easy-to-use interactive predictive analytics in a collaborative environment. This white paper takes a look at this convergence and outlines how these products can be used together so that everyone, even nontechnical users, can investigate data on their own, create analytical models and uncover new insights that drive competitive differentiation. Your analytics journey just got a lot easier.